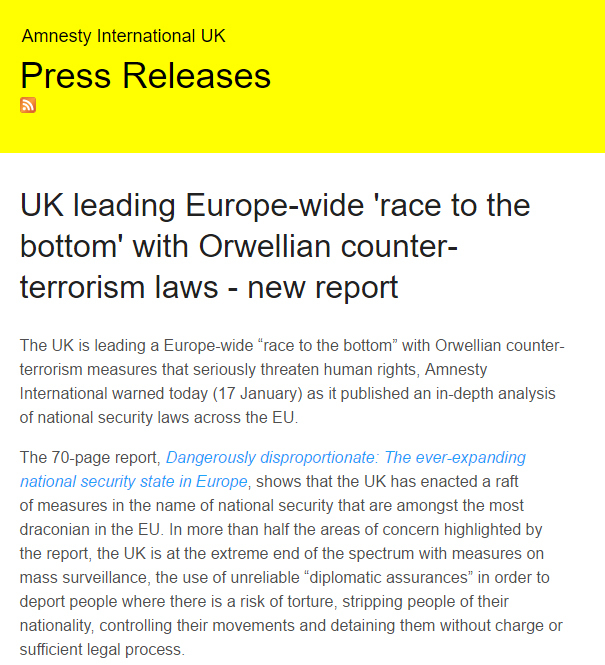 Individual EU states and regional bodies have responded to the attacks by proposing, adopting and implementing wave after wave of counter-terrorism measures that have eroded the rule of law, enhanced executive powers, peeled away judicial controls, restricted freedom of expression and exposed everyone to government surveillance. 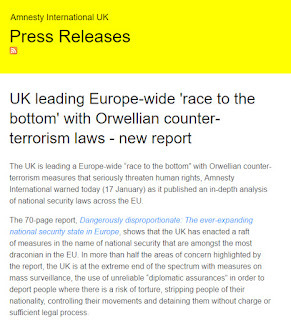 Of course as this is AI, they target the UK as the most repressive country going. I lost all respect for this bunch of ethical latte drinkers when they employed a terrorist as one of their ambassadors of torture , and men in extra-judicial detention . when the head of their gender department questioned AI about their association with somebody with very strong links the Taliban they sacked her. So it comes as no surprise at how AI has rushed to the defence of the followers of an Intolerant cult which makes no attempt whatsoever in hiding the fact they hate us all. Think I’m kidding. Ask yourself how many Islamic females do you know have been allowed to marry outside their faith and what happens to Islamic females who fall in love with a Non-Muslim.